Jason Patrick, a Beckman Postdoctoral Fellow, focuses on developing adaptive composite materials. “I am working to develop a new platform of smart composites through strategic coupling of self-sensing (receptor) capabilities with self-regulating (effector) capabilities to engender active material control,” Patrick said. 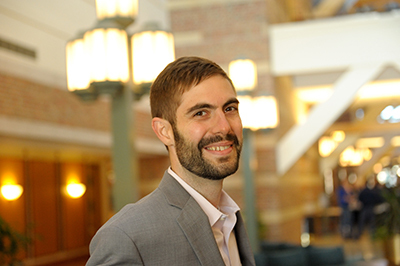 Beckman Postdoctoral Fellow Jason Patrick focuses on developing adaptive composite materials. Making the composites “smart” involves giving them the ability to sense changes as well as self-regulate. These multifunctional, synthetic materials can achieve an array of behaviors that are found in nature, such as the ability to heal themselves, much like a cut heals on its own, or regulate temperature, just as humans and animals do. Making the composites “smart” involves giving them the ability to sense changes as well as regulate. For example, instead of a damaged plane wing simply self-repairing, which is a feat in itself, the flight-critical component would also actively monitor its structural status for enhanced safety, reliability, and, ultimately, to improve its overall performance. Patrick’s doctoral research focused on the advancement of fiber-composite materials, specifically trying to reproduce biological qualities found in nature. “I created microvascular networks, akin to blood vessels in animals, to circulate functional fluids throughout polymeric materials in order to achieve self-healing of fracture damage,” he said. When fracture occurs in these materials, the “vasculature” ruptures, filling the damaged area with liquids that chemically react and “heal” the crack. ON LEFT: 3D “interpenetrating” microvascular networks: The left image shows interwoven sacrificial fibers within a structural fiber-reinforced composite. At right, a vascular network created by thermal depolymerization of the sacrificial fibers for in situ delivery of two-part reactive liquid agents to achieve self-healing of internal fracture damage. ON RIGHT: A multiplexed array of micro-electronic sensors: At left, the device is adhered to a glass-reinforcing textile that is used to fabricate fiber-composites. On the right, an infrared (IR) image of a heated fiber-composite containing an internal sensor array that can accurately determine spatial distribution of temperature (and mechanical strain) through in situ electrical resistance measurements. The idea of a vascular network was not new, however, Patrick, working in the Autonomous Materials Systems (AMS) labs, helped develop a technique ideally suited for fiber-composites using conventional processing practices, which has proven more successful than others in terms of vascular complexity and repeated repair. “By devising 3D, complex microvascular network architectures and dynamically delivering reactive liquid chemicals, we achieved greater than 100 percent recovery in fracture resistance for composite laminates over multiple damage-healing cycles,” Patrick said. These high-performance fiber-composites are used to make components for many automobiles, aircraft, and naval vessels. The microvascular networks, Patrick discovered, are also capable of modulating other physical properties, for example, temperature and electromagnetic waves. “In addition to a novel healing platform, the embedded vasculature also enabled multiphysics capabilities, including thermal regulation and electromagnetic modulation via simple fluid substitution,” Patrick explained. Refining the multifunctional capabilities and self-healing performance has become Patrick’s focus as a Beckman Postdoctoral Fellow. Working in the AMS laboratories, using the Imaging Technology Group’s Microscopy Suite for data collection, and the Visualization Lab’s high-throughput computation capabilities that he helped develop, Patrick is researching sensory enhancements to the composite materials he studies, allowing for precise control over the regulating capabilities. To create and implement the sensory elements, Patrick works with colleagues at the University of Illinois, as well as John Rogers, who is now at Northwestern University but maintains an affiliation with Beckman’s 3D Micro- and Nanosystems Group. “In collaboration with the Rogers group, I have begun to incorporate microelectronic devices within hierarchical, composite laminates to achieve self-sensing and structural health monitoring,” said Patrick. “The latest test results have shown these electronic device arrays can be employed as both thermal and mechanical strain sensors and also thermal actuators with low-power requirements,” he said. With simple measurements of electrical resistance changes, the amount of stretch or shrinkage (strain) within fiber composites can be determined over the area a device spans. By applying an electrical voltage across the device, the composite can be heated, for instance, to aid in healing or to expand operating environments, Patrick said. Through other strategic integrations of sensory components and regulating functions, Patrick is honing in on creating materials capable of monitoring themselves and modifying their structure to adapt to varying conditions. “The ultimate goal is to produce a biomimetic structural system that can not only sense its surroundings, but also, through active feedback, repair, adapt and regulate itself accordingly,” Patrick said. In order to increase the accessibility of his composite materials, Patrick continues to streamline manufacturing processes.